In the shadows of the towering Point of Rocks formation, where the Potomac slices thorough the Catoctin Ridge, sits one of the most picturesque railroad depots in the nation. 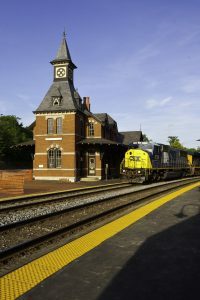 The Point of Rocks station was built in concert with the B&O’s connector line to Washington in the late 1860s, and its location—precisely where the two lines meet—is truly unique. Designed by E. Francis Baldwin, who designed several other B&O stations and depots, the Victorian-era inspired station features steep, angled roof lines, narrow windows, and a beautiful steeple on the front façade. The train station was placed on the National Register of Historic Places in 1973. It is owned by CSX, the successor to the B&O Railroad, and is still in use as an office.